Followers of Chinese handsets in Europe will have to wait until October to experience Huawei’s first quad-core smartphone: Ascend D Quad. Proclaimed as the “world’s fastest smartphone” during its launch at the Mobile World Congress last February, the Huawei Ascend D Quad might have a hard time coping up to such claim. Huawei has just announced that its debut in the UK will have to wait until October, in contrast to first anticipations of a release during Q2 this year. “Huawei Device will begin shipping the Ascend D Quad to China from the end of August, and to Western Europe from October,” said the phone maker. 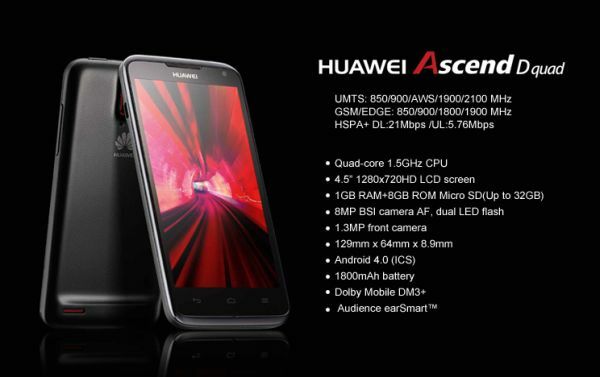 Competing against the Samsung Galaxy S3 and next-generation Apple iPhone might have to be the focus of the Huawei Ascend D Quad. This means that despite its boasted features, the handset would have to invest a lot of effort in earning its market share against the two leading phone giants: Samsung and Apple. It would be like a small sailboat transiting between two large ocean liners. Apart from its quad-core processor and 1 GB of RAM, the phone carries a 4.5-inch HD screen, an 8-megapixel rear-facing camera with HD 1080p video, 1.3-megapixel HD video calling camera and an 1800 mAh battery. Huawei also touts the Ascend D Quad for its Android 4.0 Ice Cream Sandwich (ICS) operating system. Google has recently introduced the Android 4.1 Jelly Bean and most Android fans may consider ICS outdated by the release of Huawei’s smartphone in October. As to the exact day of the month and its pricing details, Huawei was not available for comment.